Now that's how you do a midseason finale! Can you believe we have to wait over a month to find out what happens next? Ugh! It's no surprise Henry turned on his "father;" redemption was always in the cards for the character. I think many of us saw it coming. The big shock in Sleepy Hollow Season 2 Episode 11 was Captain Irving's death. Is he really gone though? This is Sleepy Hollow after all. Were you as surprised as I was that Katrina was actually useful this week? All in all, it was a truly memorable midseason finale. In Sleepy Hollow Season 2 Episode 10 Ichabod and Abbie went on a quest to obtain the Sword of Methuselah and what an adventure it was! "The Akeda" was basically the continuation, not so much an adventure as a resolution. Or, as close to a resolution as we're going to get for midseason. The electrical trouble with the car was fun enough, but let's face it – the objective was to get our dynamic duo on that bike. Ichabod was hilariously awkward, wasn't he? How brilliant was Tom Mison hopping off the bike and shouting, "I want one of these!" Can you imagine Crane arriving at the scene of a crime on his Harley? I really want to see that now. Ha! Back at Fredericks Manor, our heroes found the creepy house abandoned. Well not really, we finally learned Henry's little city model was comprised of locations he struck and naturally they formed a pentagram. How devilishly apropos, right? Suddenly, from out back, Katrina screamed and Headless was standing in front of her in all his glory. Isn't it strange how much more imposing Headless is without the head? I didn't expect Ichabod to kill him, but I knew he'd get the upper hand. Using the sword had a price; nothing's easy, is it? I had no doubt Abraham was telling the truth. I knew right away Captain Irving would be the only person who could use the sword. His soul already belonged to the Horseman of War, after all. What I wasn't expecting was Irving would be struck down in the process. My theory is he's not dead; we'll find out in the next installment Henry's actions somehow saved Irving. At least that's what I'm hoping for. Imagine if, after sidelining Orlando Jones all season, he was just killed off. It doesn't make much sense. To switch things up a bit, Ichabod and Jenny partnered up to find Irving. It's not like Frank had much choice; his soul was compromised either way. I loved watching Irving taunt Abraham with the sword. Ballsy! Jenny: The four white trees? Abraham: Not anymore. I'm afraid the trees and the forest have taken on a darker hue. War and Moloch have begun to merge purgatory and this world. With each tree that is burned black more evil may enter. Is it me or did Katrina show her true feelings for Abraham when she asked him to be spared? I don't quite understand their connection; does she love him? Ichabod was right to question Kat. I'm glad he went off on her. Hawley made a quick appearance to provide weapons for the battle against Moloch. It was amusing they left him babysitting Headless, wasn't it? The guy has officially seen way too much not to join the Scooby gang. Still, like Kat, I think Hawley works best in smaller doses. This version of Moloch was the scariest we've seen on the show. I also loved his voice, the creative team did an outstanding job with the demon this season. I thought the battle against the demon army was excellent and Katrina demonstrated some honest to goodness powers. Was that a Patronus charm? Irving taking the Horseman of War down was perfection. Do you think losing that connection helped Henry turn against Moloch? Or was it more about their conversation? Moloch: Kill the witch and the final tree will burn. Moloch: Abraham failed, he gets nothing. The witch dies first. Henry: But Abraham awaits the bargain you made him. Moloch: He is nothing. You are nothing but what I made you. Sacrifice your mother now. Permalink: He is nothing. You are nothing but what I made you. Sacrifice your mother now. It seemed fairly obvious Henry would not kill his parents by this point. I was absolutely certain he would turn around and kill Moloch; which he did. It was impressive watching it happen though, wasn't it? Is Moloch dead though? Isn't it entirely possible his spirit went back to purgatory? Or will a different demon take his place in season 2B? Is Henry a good guy now? There are so many new questions and we won't get a single answer until next year. What did you think of "The Akeda"? Is Irving really gone? What about Moloch? Will Henry join his family in the fight against evil? Let me hear your thoughts on the midseason finale, Sleepyheads. Hit the comments below. Let's discuss the season up to this point. Keep an eye out for our Sleepy Hollow round table later this week. Did you fall behind and miss an episode or two? 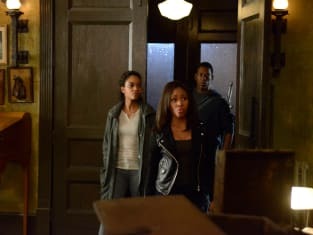 Remember, you can watch Sleepy Hollow online via TV Fanatic. Catch up during the hiatus! 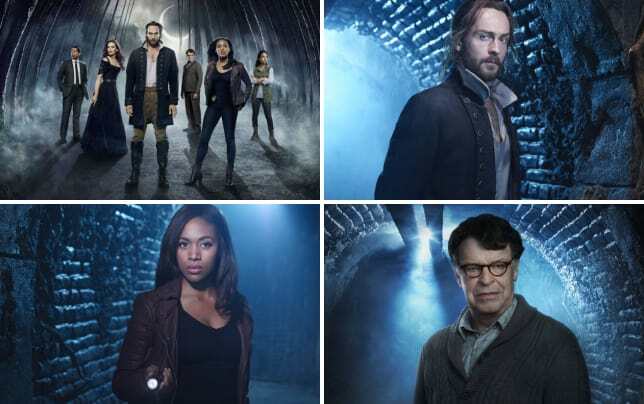 Sleepy Hollow Winter Finale: Who Died?